Heart disease affects some 10% of dogs and perhaps 15% of cats. Early diagnosis can provide a significant opportunity for treatment to alter the progression of many heart diseases, and most pets with heart disease can continue to lead full, active, and happy lives with appropriate therapy. Dr. Bruce Keene conducts an echocardiogram on a cardiology patient. 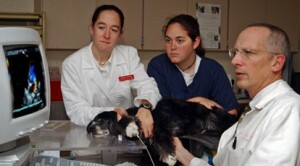 Cardiology Service in NC State University’s Randall B. Terry, Jr. Companion Animal Veterinary Medical Center. Led by four faculty cardiologists who are board certified by the American College of Veterinary Internal Medicine, the Cardiology Service provides advanced diagnostic and therapeutic modalities to animals suspected of having heart disease. In addition to caring for individual patients, the cardiology faculty designs and conducts FDA-approved clinical investigations, interventional device development, and diagnostic trials aimed at helping pets with heart disease. The opening of the Terry Center’s Hanna Heart Pavilion further expands the cardiology service’s capabilities. Technology upgrades include biplane fluoroscopy and angiography to allow accurate and rapid placement of a wider range of interventional devices; 64-slice computed tomography (CT) to create high-resolution images of the beating heart; and an EnSite System® for mapping cardiac arrhythmias and navigating electrophysiology catheters through the heart in real time. 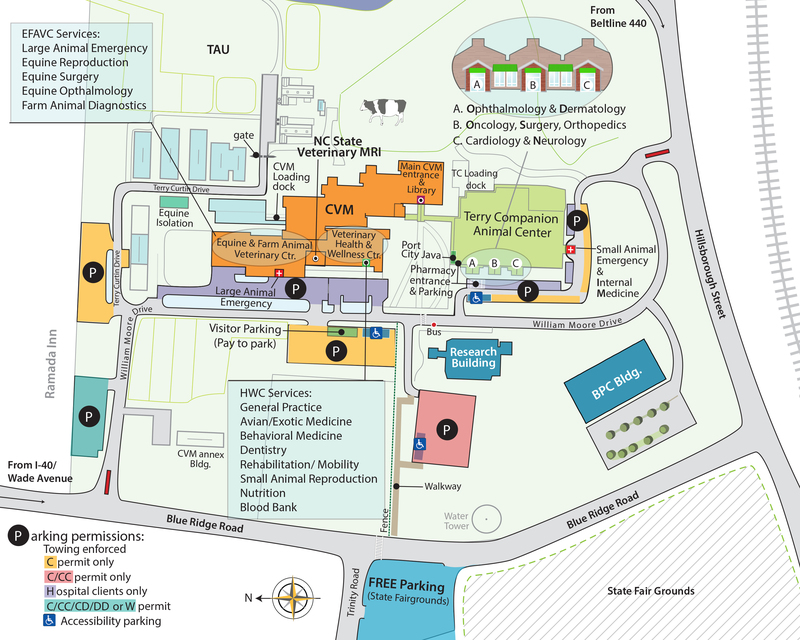 In January, 2011 the service launched the NC State Cardiology Care Network, a coordinated, multidisciplinary team supported by an educational grant from Boehringer Ingelheim. The network includes NC State critical care specialists, surgeons, nutritionists, and other professionals who come together to care for heart patients. In addition to enhanced patient care at NC State, the network provides an interactive online resource to help both family veterinarians and pet owners. Call the Cardiology Care Network Hotline tollfree at 888-962-7763 for answers to any questions that you have about your pet’s heart disease, or to schedule an appointment through the NC State Heart Failure Program. The Cardiology Care Network Technician is available 9 a.m. to 5 p.m. Monday through Friday. Outside of regular business hours, emergency assistance is available 24 hours a day, seven days week through the Terry Cener’s Small Animal Emergency Service (919-513-6911).